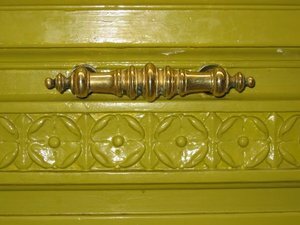 I discovered this Dijon mustard with a hint of green lacquered door while walking through the first arr., near Les Halles, with my former tour clients, now friends, Barbara Major and Paul Kaehler. Rue Mandar is off the rue Montorgueil, one of the liveliest and best-known food streets in Paris. We passed an old-fashioned neighborhood hardware shop and in the window I spotted a simple Melita drip coffee pot, the kind with the filter on top where you pour the water through. After three years of having a N’Espresso machine and dealing with the inconvenience of always replacing the pods, I was craving good ol’ drip coffee. Barbara said, “I love hardware shops” so we went in. I happily picked out my coffee pot and Barbara practically grabbed it out of my hand and insisted on buying it for me as a gift. I was so touched by her generous gesture. I now think of Barbara every day when I make my morning brew. 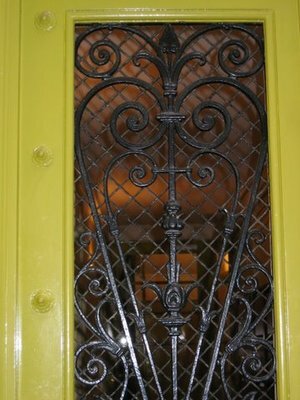 We toured the rest of the neighborhood, finding a new, very tasty chocolate shop, perused the racks of some of the fashion shops on Etienne Marcel, and went to the famous kitchenware shop A. Simon. I was so inspired by how rich the area was with things to see and experience, I decided to make it a tour destination on my Eye Prefer Paris Tours. I would love to show you this colorful neighborhood that many times is overlooked or unknown to visitors. Just ask for the Etienne Marcel/rue Montorgueil tour. I’d like to thank my good friend Elizabeth Topper, for the touching and heart felt post on her blog www.apreslebeep.blogspot.com about my tours and me. Elizabeth is a very talented and successful textile designer who lives in Los Angeles and Paris. We met last year when she emailed me saying how impressed she was with my blog and wanted to meet me while she was here. We became fast and furious friends (as she said on her post) and I am delighted she is here for the summer. yes, you are stuck with me for the summer, but i can't imagine spending time with anyone who has become a better friend than you - and in such a short time? you know the city so well, i love that there is always an adventure with you. so where will you take me next? 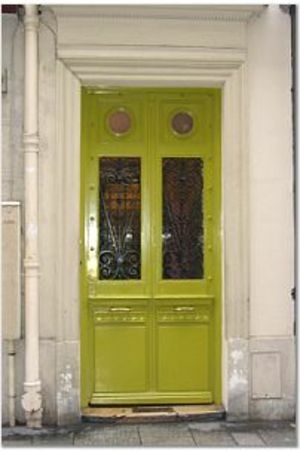 Regarding 79 rue du Temple, I used to live in this building on the first floor apartment. It is a Hotel Particulier, or I described it as a chateaux in the city It was built in 1623 and was the Hotel Montmor(if you google it you get some information). From the signs outside the door, it was owned by the Montmor family (patrons of science and academics) The famous astronomer Gassendi lived there and helped found the Montmor academy. The building was renovated in 1999 and has apartments as well as businesses on the ground floor - 2 art galleries, a clothing designer, modeling agency, toy company and film stock company. Beautiful place, wonderful place to live and the best guardien in Paris!